Monitor Audio launches 2nd-gen MASS Surround Sound package | What Hi-Fi? 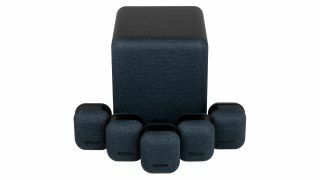 Monitor Audio has launched the second-generation version of its compact 5.1 home cinema speaker package, MASS - good news for those seeking domestically friendly surround sound, no doubt. The £600 system, aimed at those who want true surround sound but are tight on space and budget, comprises five satellite speakers and a subwoofer. Optional bespoke stands and wall mounts are available to buy separately, too. Logically optimised to crossover with the MASS Satellite, the sub utilises DSP (digital signal processing) and advanced limiters for greater control over bass response, with three pre-set modes (Music, Movie and Impact) providing some means of sonic customisation. Naturally, dials for EQ and phase control switching are present and correct. The sealed and internally-braced MDF cabinet is also finished with the company’s custom weave cloth. The MASS Surround Sound is available in Mist (light grey) or Midnight (dark grey) finishes and costs £600. You can buy bespoke satellite speaker stands for £100, too.